David Brooks gets the hardest substance use disorder cases. Brooks runs Brooks Behavioral Services LLC, which has offices in Frederick and Thurmont. At his offices, he works to help those with substance use disorder find the root cause of their addiction rather than treat the symptoms, he said in a March 13 lecture about opioids at Mount St. Mary’s University’s Frederick campus. 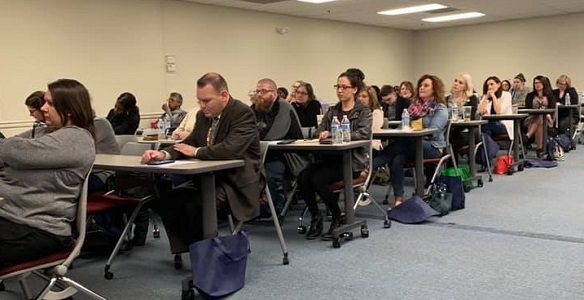 Brooks, as well as Andrew Huhn, assistant professor of psychiatry and behavioral sciences at Johns Hopkins University, spoke about opioids and treatment to a full room, many of them providers. The lecture offered continuing education credits. Huhn spoke about how doctors prescribed opioids and the rise of dependence on prescription pills. He cited a 1990 New England Journal of Medicine opinion piece that promoted the safety of opioids with little science. At the same time, he said, attitudes toward pain changed, with more doctors treating pain as something that should not exist. Pain clinics also began to open, Huhn said. Approximately 10 percent of people who abuse prescription opioids will develop opioid use disorder. Opioids are a gateway to heroin, Huhn said, adding that about 80 percent of heroin users started on prescription opioids. In the 2000s, the death rate from opioids started to rise, he said. By 2011, it had quadrupled. It continued to increase with the reintroduction of heroin and then fentanyl, in 2016. Now, the majority of heroin is altered by fentanyl or a fentanyl analog, Huhn said. Fentanyl is 50 to 100 times more potent than morphine, an opioid painkiller used mostly in hospitals, he said. Huhn spoke about the disease model of addiction, including the prevalence of relapses. People might be able to bounce back and forth between not having a problem and beginning to misuse an opioid, he said, but once they cross the line into opioid use disorder, it is a lifelong disease. In 2015, the number of people entering treatment for opioid use disorder equaled the number of those who sought help for alcohol abuse. Huhn spoke about different treatment options, including the challenges to medically assisted treatment. Most treatment regimens developed outside of the medical field, he said. “Because of that, we have a fractured system right now,” he said. And people fall through the cracks. That’s where Brooks comes in. His practice helps those who struggle with recovery, he said. He personally knows what that is like, he said, because he is in recovery from substance use. For Brooks, his addiction started with sneakers and candy. Having the most fashionable sneakers was a symbol of popularity in his community, he said. To afford the shoes, he started selling candy to the other kids. From the candy, he moved to selling marijuana, which made him more money. Then he moved on to Ecstasy and other drugs. “I left high school with a diploma, but left high school with a terrible addiction,” Brooks said. Brooks attended college and graduate school while struggling with his substance use. People would tell him to stop using drugs, but he did not know how. Finally, he met with a counselor who got to the core of his disease. She realized that his drug use started with the need to have the best sneakers. So now, as a counselor, Brooks works with people to find their root causes. “If you don’t find that, you’re wasting your time,” he said. He also looks at criminogenics, or what attributes to a person’s likelihood of committing a crime and focuses on what can be changed, he said. “My goal in this is to prevent them from going to jail or going back to jail,” he said. Fighting addiction is like trying to convince someone that they go by a different name, he said. It is ultimately about challenging someone’s core beliefs. The Mount St. Mary’s opioid discussion is just one of the opioid-focused talks in the county over the next few weeks. Throughout March and April, the Thurmont Addiction Commission is hosting movie screenings, meetings, and a speaker series on opioids and vaping. On March 28, county government organizations, including the health department and sheriff’s office, are hosting an opioid seminar.